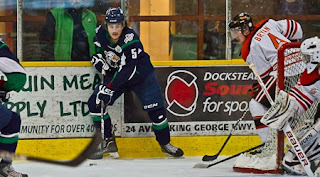 The good news keeps on rolling in for the Birds as Brady Shaw was named the Gongshow BCHL Player of the Week on Monday. Adam Tambellini was also listed under the honourable mentions. The two forwards combined for 14 points on the three game island road-trip. Surrey Eagles forward Brady Shaw has been named the Gongshow BCHL Player of the Week for the week ending Feb. 24, the league announced Monday. Shaw helped the Eagles earn five of a possible six points on a three-game Island road trip and led all BCHL scorers for the week with eight points. The Ottawa native started off with a goal and an assist and 3rd Star in an overtime win in Powell River, really hit his stride with two goals and two assists and a 1st Star nod in a tie with Alberni Valley and scored the overtime winner plus one assist in a win against Cowichan Valley. The 6-foot-2, 200-pound forward is now second in the BCHL with 36 goals on the campaign, and he leads Surrey with 67 points.